#440 in storage, April 2000. Paul Swanson photo. UP #440 began life as a Vauclain compound built by Burnham, Williams and Co. (Baldwin) in December 1900 as Union Pacific #1660. 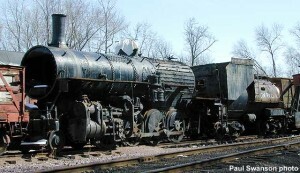 Compound locomotives used steam twice. Steam was first admitted into a set of smaller high-pressure cylinders. It was then exhausted into a set of larger low-pressure cylinders. The benefit of increased fuel efficiency was offset by the increased maintenance and expense of the complex machinery. Another disadvantage was the development of uneven stress and torque on the crosshead (where the piston rod was connected to the side rods that drove the wheels). 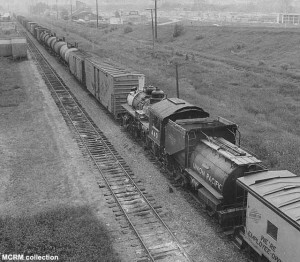 Other more practical methods of increasing a locomotive’s efficiency were soon developed (superheaters units that “superheated” the steam before it was used in the cylinders, for example). All these factors resulted in #1660’s class being “simplified” (converted to standard single-pressure cylinders). 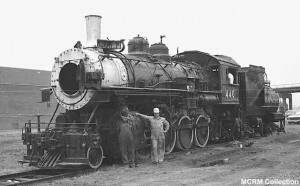 #1660 was renumbered #440 in 1915 after her shopping to a simple locomotive. In later years, #440 was used in branchline service on the UP’s various lines in Kansas and Nebraska. Forty years later in 1955, #440 was retired and donated to the Nebraska State Fair Association and placed on display at the fairgrounds in Lincoln, Nebraska. When the fairgrounds were converted into a university coliseum, #440 was saved by the Cornhusker Chapter of the National Railway Historical Society. Unable to find a home for the venerable 2-8-0 in the Lincoln area, the chapter offered #440 as a donation to Mid-Continent. She was moved on her own wheels from Nebraska via Sioux City, Iowa and Mankato, Minnesota and arrived at North Freedom in June of 1975. #440’s boiler was evaluated and determined to be restorable. Not long before #440 was retired by the UP, she had received new firebox side sheets. Other components of the boiler appeared in good condition. In the mid-1980s, funding was raised to begin replacing some 800 flexible staybolts, sleeves, and caps. Most had severely corroded during #440’s fairground display years. New techniques had to be devised to remove the remains of the existing caps and sleeves, and manufacture new ones from materials that meet today’s more stringent FRA and ASME boiler codes. By 1989, work was suspended due to lack of funding. #440 was stored, awaiting the day she could return to the shop for further work. UP #440 was traded by Mid-Continent in 2004 to Trans-Northern in return for Copper Range #29, a locomotive that better fit the Upper Midwest focus of Mid-Continent and matched two restored Copper Range passenger cars already in the collection to form a complete train. Plans by Trans-Northern to restore #440 to operation and lease it to a third party failed to happen. The locomotive was instead sold to the Langlade County Historical Society for display in Antigo, WI. The locomotive arrived there on Oct. 31, 2005. Cosmetic repairs were completed, including construction of a new cab. 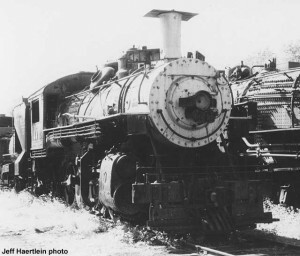 Although #440 was never owned by the Chicago & North Western, during its restoration, the locomotive had C&NW livery added in honor of Antigo’s close association with that railroad. Langlade County Historical Society has post-cosmetic restoration photos and information on their website.